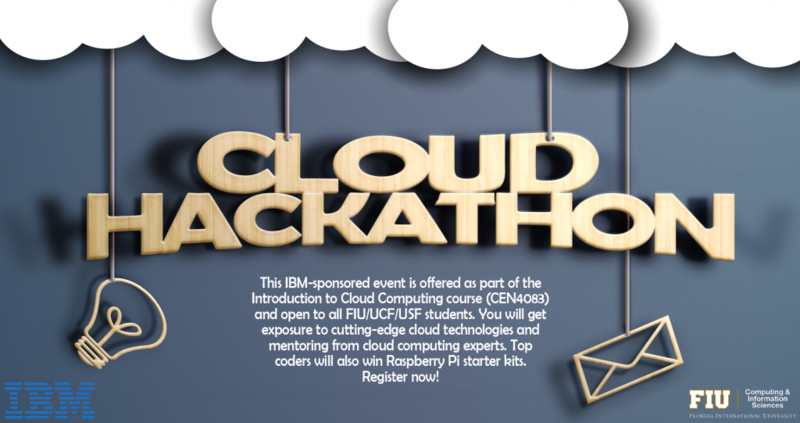 In collaboration with IBM, the FIU School of Computing and Information Sciences hosted a Cloud Hackathon. This event was offered as part of the Introduction to Cloud Computing course (CEN4083) and open to students who are not currently enrolled in the class. CEN4083 is a new course offered as a shared course to FIU, UCF, and USF. IBM supports the hackathon with free trial access to the IBM Bluemix , an industry-leading PaaS platform. You will get exposure to cutting-edge cloud technologies and mentoring from cloud computing experts. Top projects will be publicized by IBM. The top four students with the best projects will also win a Raspberry Pi starter kit (sponsored by IBM)! The hackathon will take place from March 9th to April 3rd. You can participate individually or in a group of no more than two students. Each group will be asked to come up with an idea for a project and implement and demonstrate it in four weeks. Your projects will be ranked by the organizers of the hackathon, including Dr. Ming Zhao, the creator/instructor of CEN4083, and cloud computing experts from IBM. Detailed submission instructions will be posted here later. With IBM Bluemix , you will get access to a free, 30 day trial of various runtimes (like Java, PHP) and services (like Watson , Mobile ) delivered from IBM Softlayer cloud data centers. Register for IBM Bluemix now using https://apps.admin.ibmcloud.com/manage/trial/bluemix.html to make sure you are ready to go on the day of the hackathon. IBM will also provide guest lectures and free starter code to help you start the projects and to use a catalog of free services like NoSQL data storage, Internet of Things, telephony, SMS, and email. The guest lectures will be given by IBM cloud computing architects on March 5th and 17th (see details below). Do not miss them! Access to the free starter code will be posted here later. Raspberry House, by Benigno Rodriguez (UCF)A system that allows users to change the lights and colors of a dollhouse to express sentiments by tweeting at the doll house Twitter account. The dollhouse is wired up with a Raspberry Pi and LED lights is connected to Bluemix via MQTT. The app is written in NodeRED and integrates Twitter. The hackathon is open to any registered student from FIU, UCF, and USF, but only a limited number of spots are available for students who are not enrolled in CEN4083. So register ASAP if you are interested! Bluemix Account : IBM provides 30 day free trial access to Bluemix. Make sure that you get the access when the Hackathon starts and the free period does not expire till the end of the Hackathon (April 3rd). Q&A Forum : post your technical questions here.